The, Chairman of Broadcasting Organisations of Nigeria (BON),Mr John Momoh has castigated many politicians for considering the treasury as tool for enrichment. 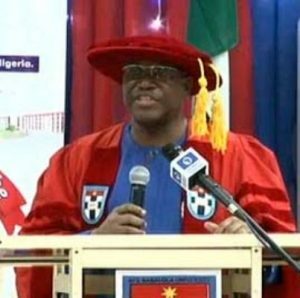 “There’s hardly any distinction, as have been shown in many cases in the past, between their private purse and that of the public,” he stated in a speech at the sixth convocation of the Afe Balalola University, Ado Ekiti. “Once an access to public funds is created, its misuse and its abuse begin in earnest. Momoh explained that the results of the activities of such individuals have been failed promises, poverty, lack of economic development, deprivation, and insecurity. “The people are alienated from government at all levels. It’s like we are back to colonialism, where the politicians are the ‘colonial masters’ and the people the subjects,” he stressed. Momoh, who is also the Chairman/CEO of Channels Media Group, identified the threat to national unity as one of the greatest challenges facing the country. “One of the greatest challenges facing Nigeria today is the threat to national unity, as centrifugal tensions, resource control and self-determination, ethnicity-based identity politics and religious cleavages have enveloped national consciousness,” he said. The BON chairman believes the issue of ethnicity and the exploitation of its residual gain has been existing in the nation since inception. He faulted some politicians whom he said were placing private interests above common and national interests, contrary to their campaign promises. According to the media guru, this has led to lip service and a slow pace of development in the country. The Channels TV boss, however, said he was aware of the conscious efforts being made at different levels to resolve the challenges facing the country. He, therefore, advised the youths to believe in themselves and be willing to adapt to any situation, as they remain the hope of the country.